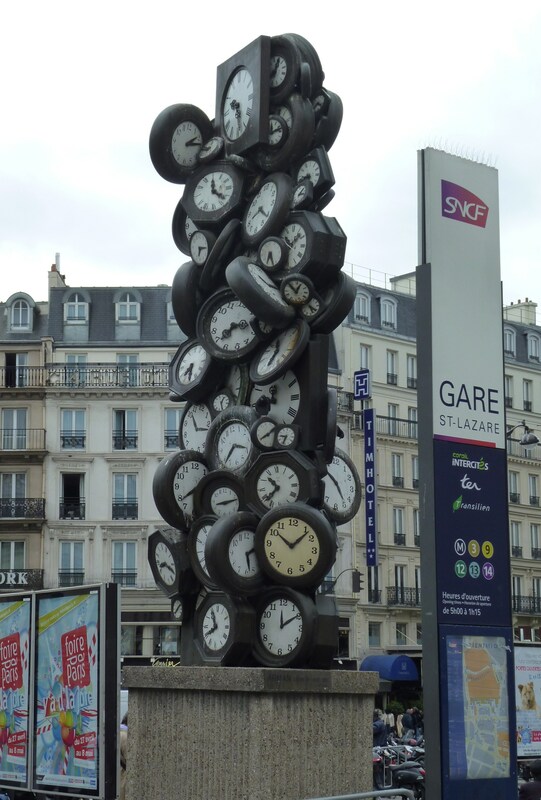 You don’t really need a wristwatch in Paris. 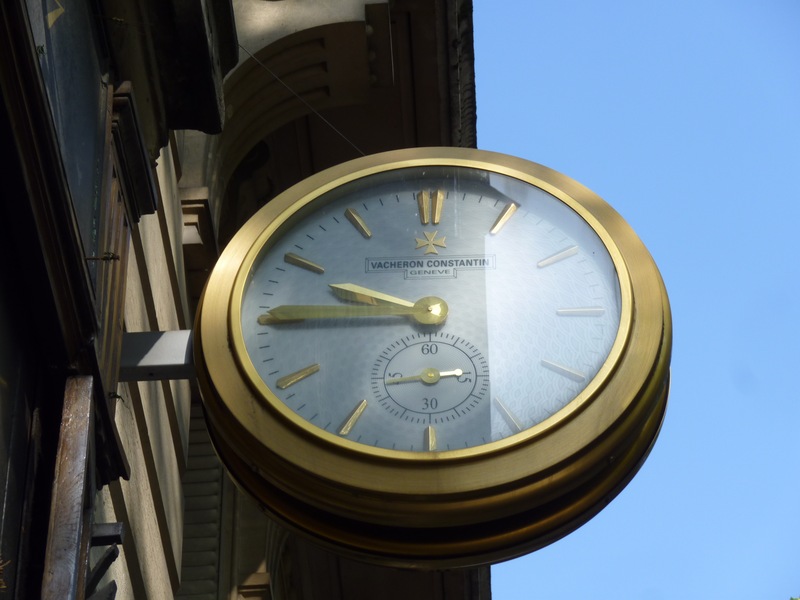 For one thing, you are never far from a clock – on walls, towers, and in front of boutiques. Some are ornate. Of all the clocks in Paris, perhaps the most extraordinary can be found in the Maison Rouge, where we went to see an exhibit of neon art. 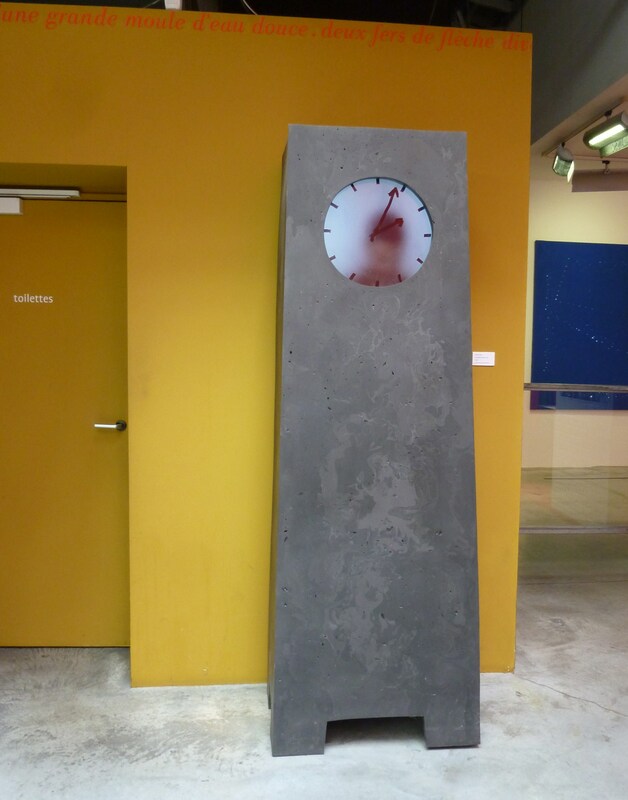 In the café near the entrance to the toilets, there is a clock with what appears to be a man standing inside. Every few minutes, he erases the hands and redraws them with a marker from the inside. I suppose it is some sort of film loop and projection system, but it is remarkably realistic. There is another reason why you can leave your watch at home. You simply may not care what time it is, or even what day it is. Sometimes you just slip out of the present and into somewhere else. You turn a corner and you are no longer in the 21st century. Woody Allen’s movie, Midnight in Paris, is all about time travel, but it’s about the people of the past, not the city itself – the hero gets to meet his literary and artistic idols, from Ernest Hemingway to Salvador Dali, as he prowls the city after midnight. And of course, that film was shot in contemporary Paris, and the streets look much as they do now, but without cars, modern shopfronts, or advertisements. If one really did go back, there would be more striking differences. The trees would be smaller, or absent. The buildings would be darkened with smoke. 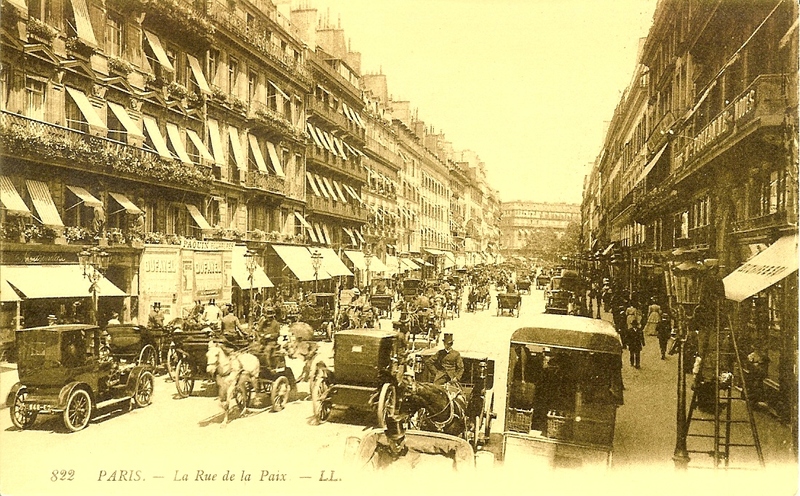 And, as Adam Roberts pointed out in a recent post on Invisible Paris, there would still be chaotic traffic, but it would be partly horse-drawn. And it would be smelly. 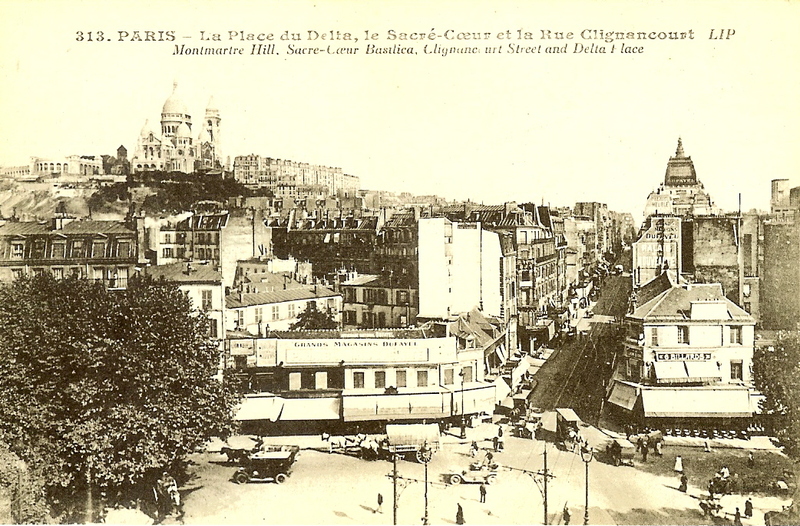 One night , I fell asleep after spending the evening sorting through some 100-year-old postcards of Paris. I dreamt I was sitting on a bench on Paris street, and I noticed among the crowds a few people dressed in what appeared to be period costume (women in long dresses, men in frock coats). I assumed they were animateurs for some historic re-creation. But as I looked around, gradually I saw fewer and fewer people in modern dress, until they disappeared altogether, and I saw only people in old-fashioned clothes. At that point, I realized I had done it – I had gone back in time. Excited, I got up from the bench and walked to the end of the street. When I turned the corner I saw… construction. Several large buildings covered in old-style scaffolding. Ah yes, the past was also full of demolition and construction in Paris. My next thought was: Where should I go, now that I am back in time? What should I see while I’m here? I went into a building and found what looked like a library. I suppose I was going to ask for a map or a guidebook of Paris as it then was. The dream took an odd turn at that point, although I was still back in time,* but when I woke up, I pondered the question, and I’d like to ask readers their ideas, too. If you found yourself in Paris 100 or more years ago, where would you go? My first thought was: Les Halles. I’d want to see the markets when they were still working and filled with life. 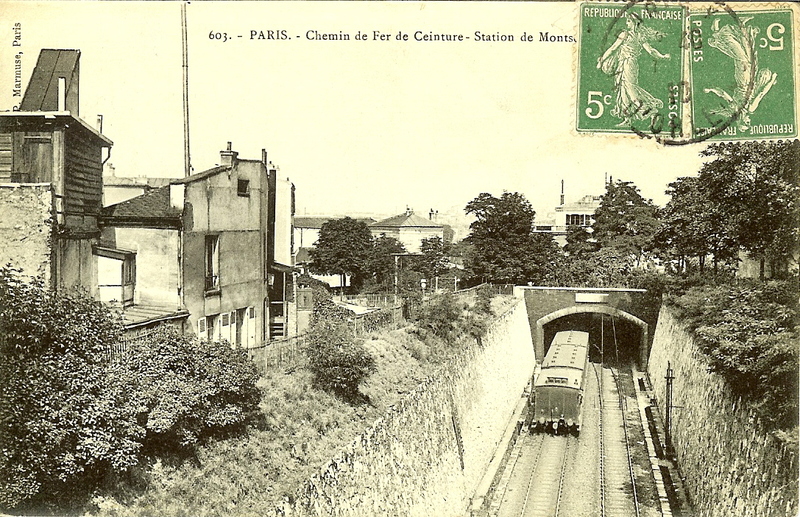 I’d like to take a ride around the city on the Petite Ceinture and see all the little stations that have since disappeared. And, of course, I would visit the Grands Magasins Dufayel in its glory days to see the magnificent staircase and the grand galleries and admire the tower topped with a searchlight that once beckoned customers. You can see the dome on the right in this postcard view. 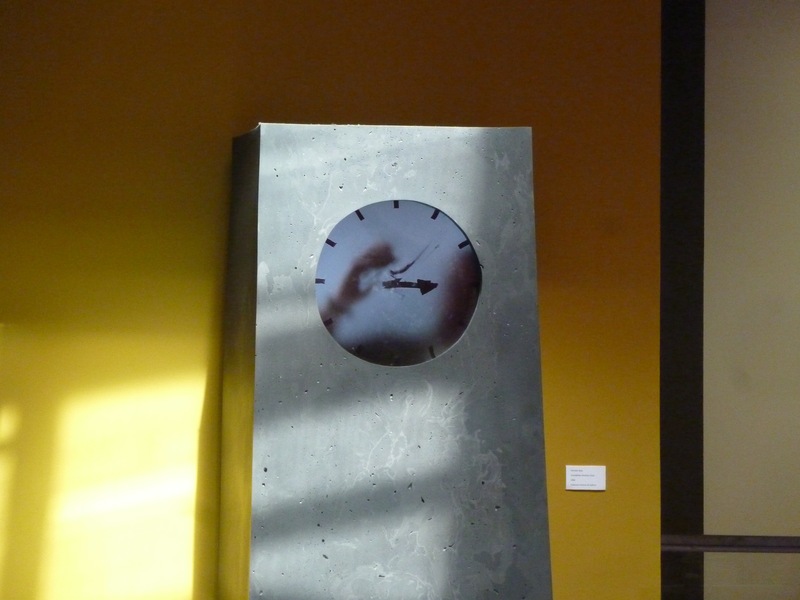 Back in May, when I was photographing clocks in Paris, I found one that seems to me to represent lost time. Behind the Musée Carnavalet, there is a little garden called Square Georges Cain, named for a former curator at the museum. On the wall of the museum are some odd architectural bits and pieces, salvaged from demolished buildings, including this fragment of a façade, with a clock that has stopped forever. 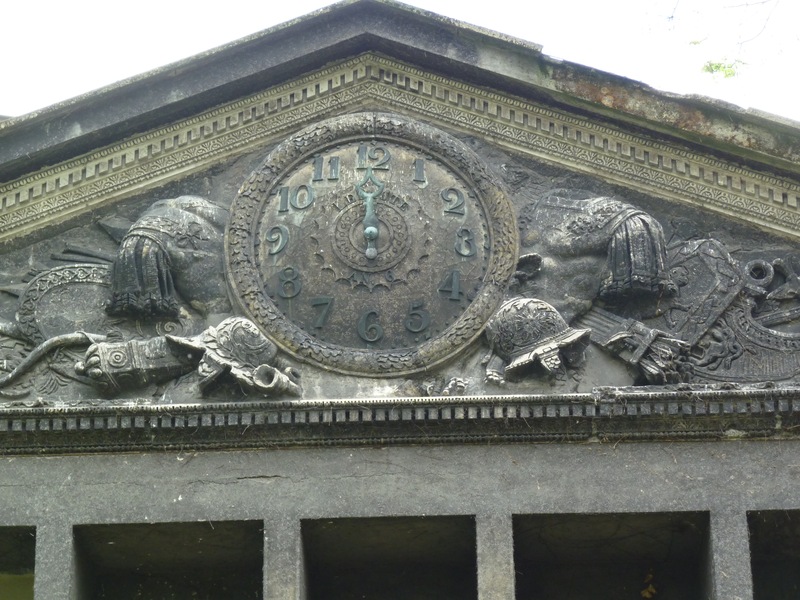 It is part of the long-gone Tuileries Palace. 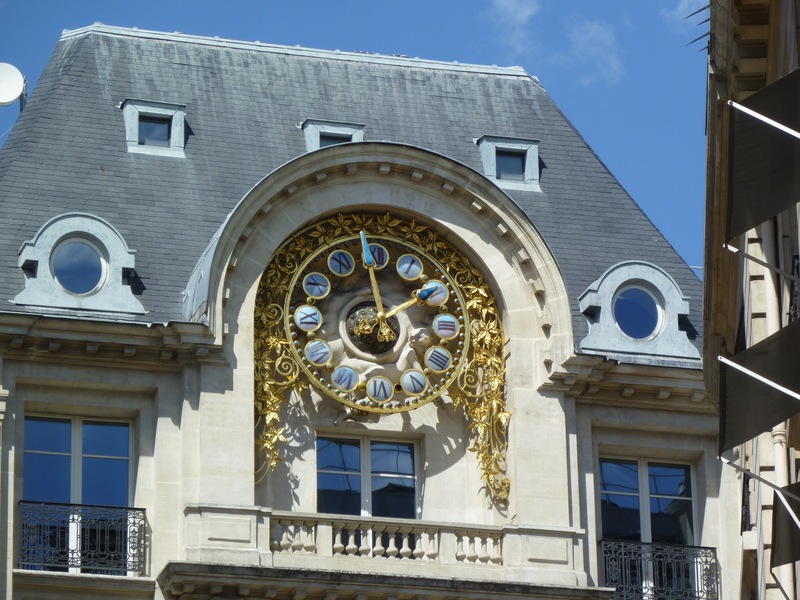 It was one of two clocks in the centre of the façade – one facing the Champs-Elysées, the other facing the Louvre. The building was torched in 1871 and stood as a burnt-out hulk for 11 more years before it was finally torn down. Somebody (Georges Cain?) 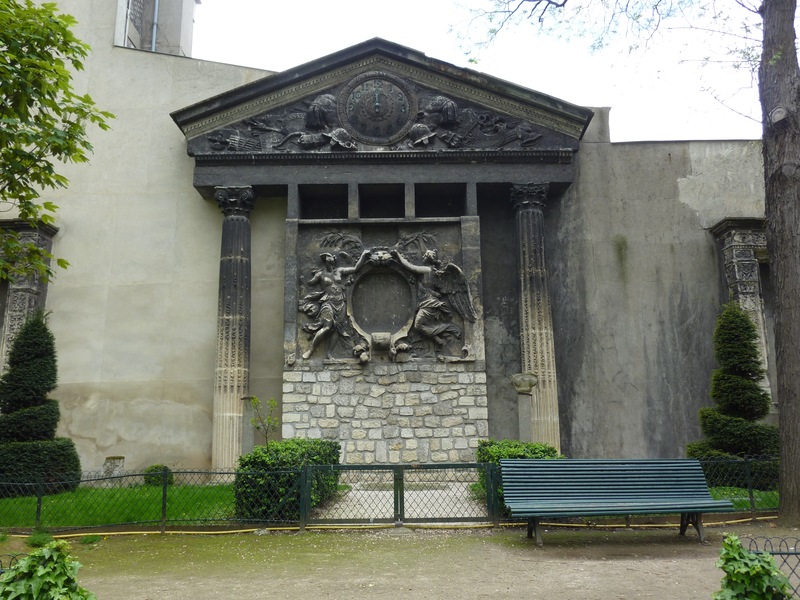 saved this bit as part of the city’s history and installed it in this quiet corner of the Marais. It’s a good place to sit and think, and to decide on one’s strategy, just in case time slips sideways and lands you in the past. *So what happened in the dream? I found myself by the canal, but the banks were grassy and undeveloped and the huge trees were not there. A woman nearby fainted or collapsed and people called for help. A boat drew up and a man got off, saying he was a famous doctor and could help. Somehow, in the way that one “knows” things in dreams, I “knew” I was seeing a historic incident, but when I woke up, I have no idea what it might have been. This entry was posted in Paris history, Paris nostalgia, Paris postcards, Paris streets and tagged Adam Roberts, clocks, Georges Cain, Grands Magasins Dufayel, Invisible Paris, les Halles, Louvre, Midnight in Paris, Musée Carnavalet, old postcards, Paris traffic, Petite Ceinture, railways stations, Tuileries Palace, Woody Allen. Bookmark the permalink. I love the blog and appreciate your efforts. Very much. Wonderful post! My favorite clock is the one in the Musée D’Orsay, although it has been under restoration for some time. And I couldn’t agree more with your desire to see Les Halles in its heyday as a market. I hope its future incarnation will be more successful than the disastrous 1970s experiment in “urban renewal” was. The pictures are wonderful as always but I’m more interested in that dream. As a firm believer in the significance of dreams I wonder if it may have been something you actually witnessed in another existence? Perhaps you lived in Paris at some point and that’s why you’re drawn back and in over and over. Fascinating, and I love the photographs. The Paris I’d like to see is in the early days of the Metro, when all those art nouveau stations still had glass canopies, and the insides hadn’t been modernised and mechanised. have a great week, peaceful and without any timely pressure! I would like to enter Paris by train into the Orsay station. 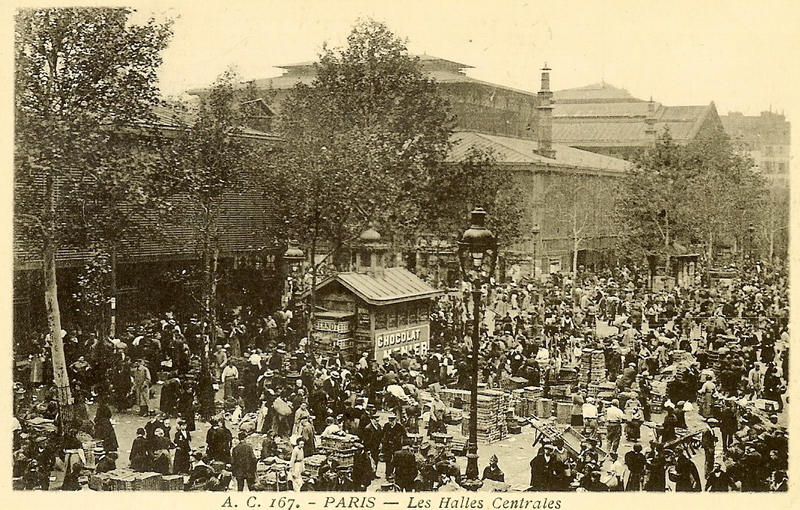 I would also like to experience Les Halles, but I’m sure it would seem overwhelming, crowded and smelly compared to today’s markets. I would soon regress back to my favorite pastime of people watching at a sidewalk cafe. Is the man inside the clock the same one who kept the pendulum going? 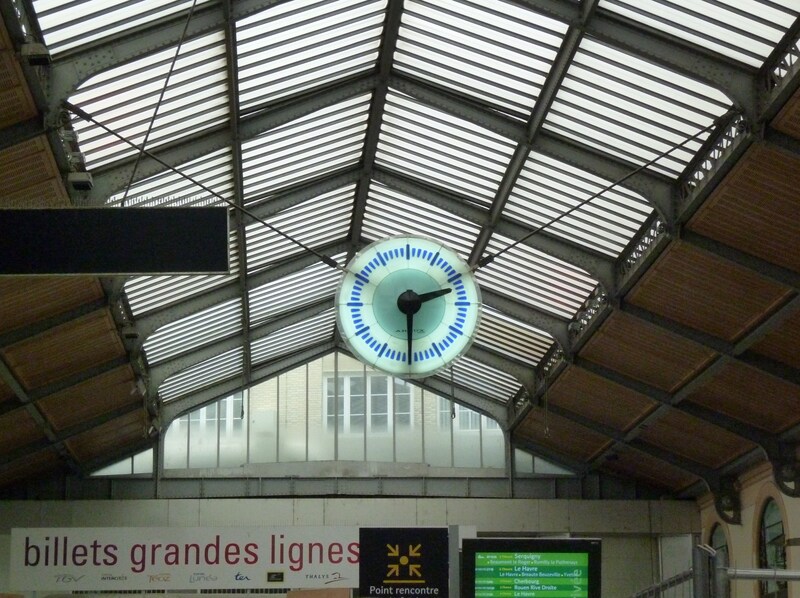 Interesting to see these examples, because I’ve always felt that Paris is a city without clocks! However, even the ones that you show generally don’t work, but in a place where being punctual is frowned upon, this should not be a surprise! Going back in time 100 years in Paris is not a huge leap of the imagination, because not much has changed in that time. I would rather go back to the pre-Haussmannian city, or at least out onto the fortifications around the city – the zone – which I imagine would be a real eye-opener. Great post! I would go to the Cafe Voisin during the siege of Paris in 1870 to see if it was true that they were serving dishes that had once been zoo animals. If I could go back in time my first stop would be a long one to watch the construction of the Eiffel Tower. I love it now but wonder how I would feel as it grew up and up to dominate the skyline. Next stop would be the International Exposition of 1900, perhaps the finest of its kind, to see all of the amazing technology we now see as so old. Finally, a leisurely stroll along the Champs Elysées in the early 1930s to visit the stunning auto show rooms and watch the cars being unloaded for the international auto show. Hello and thank you for introducing yourself. A time travel novel about a woman going back to 1911 sounds fascinating! Keep us posted on your progress. I think that the 19th and early 20th centuries were much, much smellier — from horse manure to open sewage ditches to the lack of deodorant. Some people carried nosegays, which were little bouquets of strong-smelling flowers that they held to their noses to cover up the stench. Although people get used to smells if they encounter them everyday, for someone from the present-day, the past might be a bit overwhelming. However, Paris is full of gardens and open spaces created to allow breezes to blow through, so I think you can make a case for the “breath of life,” at least initially.